Based at Stonehenge, Human Henge engaged people living in Wiltshire with mental health conditions in a creative exploration of the ancient landscape. The project began in September 2016 and ended in December 2018. A parallel research project led by Bournemouth University addressed the question of whether Human Henge was an effective way to improve people’s mental health and wellbeing. Evaluation by Willis Newson considered the project’s processes and behaviours as a contribution to its impact on participants mental health. This evaluation and the research above concludes that Human Henge exceeded expectations in terms of its impact on participants, partners and the wider archive and mental health community. Overall it has been a successful project that we hope can be a model for similar projects to take place in other historic landscapes. Human Henge grew out of a conviction, shared by the partners, that a connection with historic landscapes could play a real part in mental health recovery. Human Henge Change Minds was intended to have heritage, social and mental health outcomes, and as such amalgamated its partners’ concerns. English Heritage and the National Trust are heritage organisations with social purposes. Richmond Fellowship is a national mental health charity with a history of using community assets including historic landscapes for inclusion. Bournemouth University is an academic body with a strong social purpose and local connection. The Restoration Trust is a bridge organisation linking these outcomes, as it supports people with mental health issues to engage with heritage in order to reduce social exclusion and improve people’s mental health. The project was largely funded by the Heritage Lottery Fund, but additional grants from English Heritage and Amesbury Area Board rooted it in Stonehenge and the local community. Broadly, Human Henge followed the Activity Plan we submitted with our original application, with agreed amendments. Funding for Human Henge Avebury extended the programme of participation and research and in effect Human Henge at Stonehenge and Avebury became one project. However, this evaluation report focusses on Human Henge Stonehenge. The first step on securing the grant was to set up a Project Board representing partners and key stakeholders, chaired by Dr Sara Lunt, a trustee of the Restoration Trust. Project Board meetings were well attended and often quite powerful experiences. There was robust debate about important issues, such as the wellbeing of participants the nature of research, ownership and rights over local heritage, and communications strategies. Most meetings were minuted by a Stonehenge staff member who attended for this purpose. From the outset we did all we could to make Human Henge as safe as possible for everyone involved by policies and procedures which conformed to legislation and best practice. Data protection, communications and safeguarding were key issues where we set up policies in the preparation phase, and put them into practice in our enrolment forms, partnership agreements and employment contracts. Human Henge aimed to improve the health and wellbeing of people who have mental health problems. It was not a mental health service. Although everyone had a duty of care to participants, to behave sensibly and kindly, and to record and share any concerns, Human Henge did not provide wider support. This was the responsibility of Richmond Fellowship. We maintained these boundaries in order that participants could enjoy Human Henge without feeling that they might be treated as patients or clients. It was also an important safety measure since mental health risk was assessed and managed by Richmond Fellowship. In preparing to deliver Human Henge, we agreed the programme of sessions, and confirmed bookings of the Stonehenge Education Room, access to Stonehenge landscapes and exclusive access to the Stone Circle on the Winter Solstice 2016 and Spring Solstice 2017. Tapered sessions for participants, funded through Human Henge Avebury, were held at the Ancient Technology Centre and Wiltshire Museum in 2018, and Stonehenge Visitor Centre/Stone Circle (forthcoming, March 2019). In October 2016 we offered staff and volunteers mental health first aid training delivered by an accredited Mental Health First Aid trainer who was also a Richmond Fellowship staff member. 16 people attended, including board members, staff and volunteers. The Coordinator is an archaeology and natural voice practitioner, so she brought heritage and creative skills to the project. Therefore, it was unnecessary for the Richmond Fellowship Locality Manager to acquire heritage skills, and he already had a deep interest in and knowledge of the natural world and creative writing. In total 32 people were recruited and 23 people attended the programme as committed participants, i.e. they attended more than half the sessions. All these people consented to take part in the research component of the project. Participants were enrolled through contact with their Richmond Fellowship support workers. Our recruitment leaflet was designed to be as clear and informative as possible, and also to alleviate anxiety about doing something entirely new. The enrolment form including consent for information sharing, photography and communications, as well as information about the participant and a wellbeing plan. Enrolment forms were held by both Richmond Fellowship and the Restoration Trust. Human Henge was intended to be a pilot project into the efficacy of using historic landscapes for mental health, so it was essential that we had a robust evaluation strand. This fell into three categories. Project staff – the Project Manager and Coordinator – collected data about attendance, events, visitor numbers and so on, for reporting outcomes at that level. Bournemouth University were commissioned to carry out research addressing the question: “Does a creative exploration of historic landscape achieve sustained, measurable mental health and wellbeing outcomes for people with mental health conditions?” Answering this was achieved through two parallel investigations. First, a study of available literature and published case studies was collated and published as a chapter in the volume A handbook of well-being edited by Kate Galvin (Darvill et al. 2018). Second was an evaluation of the impact of the Human Henge project on the mental well-being of its participants. This was published in two reports; firstly in June 2017, secondly in December 2018. An appendix to the final report will be produced when Human Henge Avebury participants complete a final 1-year post project questionnaire and focus group. Willis Newson were commissioned as the project’s ‘Critical Friend’/Evaluator, with a brief to: take an observer / critical friend role asking sometimes difficult questions; contextualise the project within wider work taking place across the Arts and Health sector / arts on referral / arts and health evaluation and research /good practice; signpost / make introductions to what is going on nationally; comment on how best to make the research findings accessible and implementable with the sector and amongst practitioners. Jane Willis’s report on Why and How does the Human Henge Project Support Participants Wellbeing was completed in July 2018. In brief, outcomes are summarised below. It is difficult to answer the original research question “Does a creative exploration of historic landscape achieve sustained, measurable mental health and well-being outcomes for people with mental health conditions?” conclusively at this stage as data collection and analysis is still ongoing. Nevertheless, findings to date highlight that involvement in Human Henge had a positive impact upon participants’ mental health and well-being, and to some degree this was still apparent one year after involvement in the programme. However, caution is required because of the relatively small sample size and the limited extent to which it is can be said to represent the bigger picture. Accordingly, further data collection is needed before any claims about the generality of the findings can be made. It is proposed that a larger study, possibly with a control group, needs to be undertaken to explore the potential of this type of heritage programme for the health and well-being of people with mental health conditions. Willis Newson (Arts and Health Consultants) theorise that Human Henge is a cycle of transformative processes through: safety and trust; challenge and risk; achievement and confidence; connection. Safety and trust is built by secure partnerships and structures and good communication. Participants are overcome challenge and risk through expert facilitation. Positive feedback to mutual sharing enhances the sense of connectedness. The enhanced sense of connection leads to an increased sense of safety and trust. New risk and challenge is introduced and the cycle continues. A deeper sense of achievement leads to increased self-esteem. Continued sharing leads to deeper connections. Deeper connection and bonding leads to an increased sense of safety. New Economic Foundation’s Five Ways to Wellbeing. Take notice: the whole group has an intense sensory experience of the landscape. Be active: people get out and about, walking further and more confidently session by session. Connecting: people connect across deep time, with the place they live, and with each other. Learn: archaeology, creativity, nature, knowing a place. How to be with a group. Give: the group shares the experience. People help each other in practical ways. Human Henge research by Bournemouth University comprised a mixed-methods approach summarized schematically below. The process was reviewed and approved prior to the start of the first programme in line with Bournemouth University Research Ethics Code of Practice. It was important to capture both quantitative and qualitative data because the sample size was small and, whilst interesting, means that conclusions derived from the evaluation so far have limited generality. At the start of each delivery of the Human Henge programme the participants completed a baseline questionnaire capturing their thoughts and feelings towards the project. The Short Warwick Edinburgh Mental Wellbeing Scale (Tennant et al. 2007) was used to measure their mental wellbeing, supplemented by questions regarding their interests in history, heritage, and archaeology (see Table 2). The same questionnaire was repeated in the middle and at the end of each 10-week programme, and again for a final time in 2018 a year after the sessions finished. Quantitative data was analysed using descriptive and inferential statistics as well as content analysis, qualitative data from the evaluation was analysed thematically using the Braun and Clarke (2006) process of thematic analysis. Project manager, coordinator, consultants, designer and volunteers appointed. Human Henge has amply met all the Restoration Trust’s criteria for success, which are informed by and embodied in the project. Participants have problems with their mental health. Human Henge participants had complex mental health needs. Participants are involved in management. One participant became a member of the Change Human Henge Project Board, 8 contributed to a Sharing Event and 4 attended a Restoration Trust Participants Council. The Project Board included a Patient Public Involvement member. Partnership with heritage and health organisations. The partnership between the Restoration Trust (RT), English Heritage, Richmond Fellowship and Bournemouth was confirmed in a signed partnership agreement which stated that the partners would deliver the project according to our application to Heritage Lottery Fund. All partners are members of the Project Board. Contributing organisations, including the National Trust, Avon and Somerset NHS Partnership Trust are represented on the Project Board. Groupwork is the core. 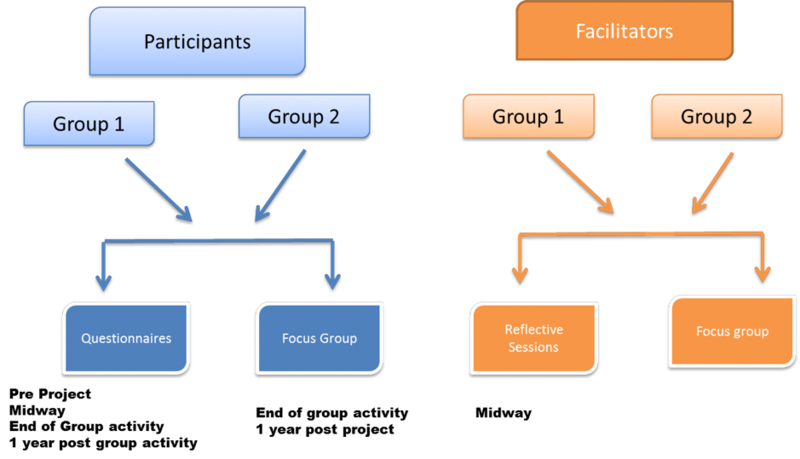 All sessions were group sessions and informed by relevant theory and practice. They were based on the view that lasting change can occur within a carefully conducted group. Safe framework and practice. The partners’ policies and practices meet the required standards, and due diligence was applied when forming the partnership. Staff and volunteers worked to relevant professional standards and, if it was required for their role, had external validation of their suitability to work with vulnerable people by showing evidence that they have Enhanced Disclosure and Barring Service Certificate (DBS). Sustained and regular involvement. 10 weekly sessions. Three workshop sessions after the project ended. Ongoing informal connections between people and through the Humans of Stonehenge private facebook group. Richmond Fellowship ongoing history projects, including visits to Wiltshire Museum, and a series of workshops at Salisbury Cathedral. Privileged access to real cultural assets and expertise. Assets: Exclusive use of Stonehenge Education Room, special access to Neolithic Huts with Stonehenge volunteer input, special access to Stone Circle, special access to National Trust Cottages for King Barrow Ridge. Expertise: sessions with Professor Tim Darvill, Dr Sara Lunt, Katherine Snell, Yvette Staelens, Mark Vyvyan Penney, Briony Clifton. Museum visits included Wiltshire Museum tour with the Director, Salisbury Museum (Festival of Archaeology). Encouragement to be creative. Music, pottery, creative writing, photography and encouragement to tell stories and share language and song. Learning for staff and volunteers. Health learning: Mental Health First Aid. Heritage learning: Prehistory and the Stonehenge landscape; collections, Neolithic pottery and firing; bread making. Research learning: Staff and volunteer reflective practice focus group. Good practice learning: Project Manager supervision by a Group Analyst, Coordinator supervision by the Project Manager. Professional learning: Staff and volunteers attended relevant professional meetings. Learning from participants: experiences of nature, photography, music, spirituality, history, archaeology, managing mental health, practical financial advice and friendship. Progression for participants. Volunteering and participation opportunities offered by all partners. Participation opportunities taken up at conferences, workshops, events and media. The demands of the site. The immense benefit of running a project at Stonehenge in terms of public and professional attention was matched by the need for attentive management of the delicate balances required in dealing with conflicting interests at a contested site. We were not always successful in negotiating these tricky waters, and indeed they were not really our business. However they sometimes impacted on the project, or rather they demanded more time than we had allocated for project management. Partnership. The Restoration Trust is a small organisation managing a complex partnership of much bigger organisations, some of whom have competing interests. Cuts to services and contracts. The Richmond Fellowship’s outreach and inclusion contracts have been reduced since the project began, and this has made it more difficult for the Locality Manager to provide staff resources to support people to attend follow-on activities. Mental health discrimination. There is a level of unconscious discrimination against people with serious mental health problems which is manifest by partner organisations and professionals in unexpected ways. Excessive anxiety about what people might do on site, or how to cope if they became unwell reflect wider societal attitudes. Participants were sometimes surprised and disconcerted by views expressed by volunteers, staff, students and the general public. Ending the programme. The ending of the programme was experienced as a considerable loss, as it was rather abrupt. As a result we gained funding to run three follow-on sessions, which have been successful gatherings of Human Hengers at local heritage venues (Ancient Technology Centre, Wiltshire Museum, Stonehenge Stone Circle in March 2019). Overall Human Henge has been a successful project, with benefits for participants, partners, stakeholders and the local and professional community that went beyond our expectations. It justified our original supposition that walking with intent in ancient landscapes has the potential to support the recovery of people with complex mental health needs, although research outcomes are not conclusive. However the enthusiasm with which Human Henge was received by both heritage and health professionals shows that imaginative use of heritage landscapes can make a profound difference to individuals, and we hope also to mental health and heritage policy and practice at local and national levels. We are very grateful to our partners, staff, volunteers, researchers, board members, local media and national media, and those who visited Human Henge exhibitions and events. We thank the Heritage Lottery Fund for their grant, which enabled the project to take place. Our foremost thanks go to all the Human Hengers, who through their courage and commitment turned the idea of a creative exploration of historic landscapes into a powerful experience for everyone involved. This entry was posted in General on January 30, 2019 by hhmaster.